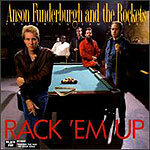 CD review: "Rack 'Em Up"
This review first appeared in the May/June 1990 issue of Living Blues magazine. This album by veteran blues singer/harpist Sam Myers and young Texas blues guitarist Anson Funderburgh is as rich as their previous two  "Sins" and "My Love Is Here to Stay." And while blues fans know all about Myers and his youthful apprenticeship with Elmore James, Funderburgh may soon change the way ethnomusicologists view the role of white performers of the blues  much as Bix Beiderbecke did with jazz a half-century ago. If Johnny Winter and Stevie Ray Vaughan can be dismissed as whites playing rock music that is derivative of blues (although Muddy Waters said just the opposite of Winter), the same cannot be said of Funderburgh. Nor can it fairly be argued that he remains a second-rate bluesman. On "Rack 'Em Up," we get more of the same winning Myers-Funderburgh formula: Myers' rich vocals and harp set against Funderburgh's scintillating guitar work. Myers' vocals are smooth, but with a sparkling vitality and energy that makes full use of his range. Funderburgh's playing remains a study in starkness, with lean, crisp passages. Of interest on this album, however, is his increased use of echo "effects" boxes for more of a twangy sound, giving a heightened Texas feel to his playing. This is particularly evident on "All Your Love" (an Otis Rush tune). The Rockets' rhythm section  drummer Marc Wilson, bassist Mike Judge, and pianist Matt McCabe  set down a beat that is a cross between Caribbean and Amerindian. While Myers leads the song on vocals, Funderburgh backs him with a fuzz sound on his guitar that sounds very similar to what Vaughan and Z.Z. Top's Billy Gibbons used. Funderburgh steps out of the picture completely on "I'll Keep on Trying," a slow, R&B-styled tune. The top-notch horn section (Grady Gaines and Mark Kazanoff on saxophones and John Selzer on trumpet) swingingly backs Myers' impassioned vocal performance. The instrumental title track shows Myers' harp playing to be just as warm as his singing. Myers and Funderburgh trade leads and solos, and the musical empathy between the two men is readily apparent. Gaines gets a chance to solo on tenor sax on "Since We've Been Together" and "Tell Me What Have I Done Wrong? ", and makes the best of most. On "Since" Myers also lays down a harp solo that just sizzles. "Rack 'Em Up" is that rare album that will please both traditional blues fans and those listeners who like a more contemporary approach. The odd coupling of Myers and Funderburgh becomes more attractive with each outing.